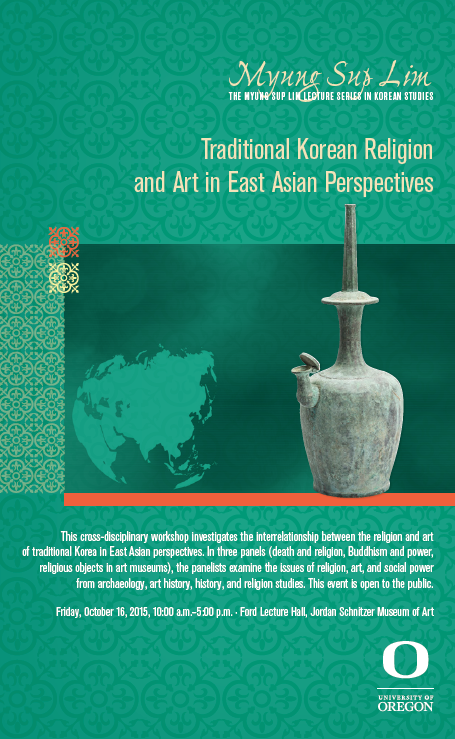 This cross-disciplinary workshop investigates the interrelationship between the religion and art of traditional Korea in East Asian perspectives. In three panels (death and religion, Buddhism and power, religious objects in art museums), the panelists examine the issues of religion, art, and social power from archaeology, art history, history, and religious studies. This event is open to the public. Over the last several decades, archaeologists in China have recovered many manuscripts from tombs that date from the late 5th century BCE to the second century CE. The sheer diversity of these manuscripts is their most striking feature: written on bamboo, wood, and silk, they include a stunning variety of textual material, from philosophical treatises to almanacs to ceremonial records. All of them, however, should be understood as ritual objects that played important roles in funeral rites. Even this ritual significance of interred manuscripts, however, defies easy categorization, and their idiosyncratic nature is just as striking as any overall pattern. Only when analyzed in the context of tomb architecture and interred funerary goods, which transformed significantly over the period under consideration, do we gain purchase on the significance of written manuscripts to notions of death and the afterlife in early China. Starting as early as the 5th century BCE, tombs started transforming into structures akin to palaces or residential structures, while collections of interred goods, previously populated by ritual bronze sets used in ancestral rites, became dominated by items for use in everyday life. Without denying the myriad purposes of and interpretive possibilities presented by funerary architecture, material goods, and written manuscripts, this talk emphasizes that in the early Chinese context all three collectively comforted and protected tomb occupants as they moved into the afterlife. Gyeongju grew as a cultural and political center of Silla, one of the Three Kingdoms that emerged in southeastern Korea well before the Common Era and unified the other two states, Goguryeo and Baekaje (Unified Silla, 676 to 935 CE). Royal tumuli have grabbed most of the archaeological attention in the Silla region since the turn of the century, but excavations have been limited to more or less visible tombs in the area called the Grand Tomb Park (Historic Sites of South Korea No. 512). Since 2007, long-term systematic fieldwork and a ground-penetrating radar survey in the area have mapped over 150 tumuli (mound burials) and underground burials. These findings illustrate mortuary practices over 300 years from the 3rd to 6th centuries and reflect social dynamics and the authority of Silla elite classes as well as the influence of indigenous beliefs and Buddhism. Lee investigates human-environmental interactions in terms of cultural relationships and social complexity in East Asia, aiming to document and to understand cultural niche construction, the transition to agriculture and complex society, crop domestication, and political economy in prehistoric and early historic East Asia. She is involved in projects in the Yellow River basin and the Dongbei region of China and in South Korea. She has secured multiple grants by the Henry Luce Foundation, National Geographic, Korea Research Foundation, Academy of Korean Studies, Korean Studies Promotion Service, and Social Sciences and Humanities Research Council of Canada, and University of Oregon. Her work appears in English, Korean, and Chinese, including Anthropocene, Anthropological Archaeological Science, Antiquity, Current Anthropology, The Holocene, Journal of Archaeological Science, PLOS ONE (Peer-Reviewed Open Access Publication of Public Library of Science), and PNAS (Proceedings of National Academy of Sciences US). Ina Asim is Associate Professor of History with a focus on pre-modern intellectual, social and material culture of China, including the material witnesses brought to daylight through contemporary archaeological excavations. She is working on a city biography of Nanjing and several projects in the Digital Humanities. She has served as Head of the Asian Studies Program and the Humanities Program at the University of Oregon and is currently the Director of the UO Confucius Institute for Global China Studies. She received her Ph.D. and her Habilitation from the University of Würzburg in Germany. Sŏkkuram is arguably the most representative monument in Korea, functioning as a proud “national emblem.” Scholarly discussions over the past century have agreed on such fundamental issues as its date, benefactors, construction methods and stylistic lineage. There have been, however, unwarranted assumptions and disputes about the prototype of its overall design, iconographic program, doctrinal/sectarian orientation as well as the identity of its primary deity. Here I reflect on the conventional master narrative of its donor and construction, to tease out Sŏkkuram’s role and even essence during eight-century Silla. This talk incorporates recent developments from studies of Korean Buddhism and its visual culture, reading Sŏkkuram as a “Heavenly Palace (K. Ch’ŏn’gung天宮)” and searching for its architectural origin within the Central Asian tradition. Sunkyung Kim got her B.A and M.A in Art History from Seoul National University, Korea, and Ph.D from Duke University with a dissertation entitled “Decline of the Law, Death of the Monk: Buddhist Texts and Images in the Anyang Caves of Late Sixth-century China.” She has received a postdoctoral fellowship from the Andrew Mellon Foundation, a research fellowship from the Asian Cultural Council, and a travel grant from the Sejong Society of Korean Studies. During her time as a postdoctoral fellow and visiting scholar/lecturer at the University of Southern California, she also served as a research associate for the “InscriptiFact Project” at the Archeology Center at USC and worked with the Korean National Museum on optimizing digital images of inscriptions of the 7-8th century stone steles and sculptures. Her research interests encompass Buddhist art, mortuary practices and visuality in early medieval China and Korea, East Asian visual culture and religion in general. Her publications have appeared in Archives of Asian Art, The Journal of Korean Studies, Asia Major, Art History Forum, and Art History and Visual Culture. The centrality of relic worship was acknowledged and often eagerly embraced as Buddhism made its way eastward through dynasties and kingdoms in China, on the Korean peninsula, and in the Japanese archipelago. The early reliquaries discovered from these regions often came in multiple containers nested inside each other, generally following the South Asian and Gandharan precedents. Beyond this general similarity, however, the reliquary sets typically included varying combinations of vessel types, materials, and ornamentational schemes, and the total number of vessels used also frequently varied from one set to another. Focusing on the vessels used in the fifth- to eighth-century reliquary sets found in China, Korea, and Japan, this study proposes the mediation of translation—a required process in the transmission of the religion from India to China—as a possible source of the commonalities and diversities observed in the East Asian reliquary sets. Akiko Walley received her Ph.D. from Harvard University in 2009. She specializes in Japanese Buddhist art and archaeology from the 7th and 8th centuries. Her monograph, Constructing the Dharma King: The Hōryūji Shaka Triad and the Birth of the Prince Shōtoku Cult, is scheduled to be published in 2015 from Brill Press as Volume 15 of their Japanese Visual Culture series. Other recent publications include: “Flowers of Compassion: Tamamushi Shrine and the Nature of Devotion in Seventh-century Japan,” Artibus Asiae 72, no. 2 (2012); “Inscribing and Ascribing Merit: Buddhist Vows and the Hōryūji Shaka Triad,” Harvard Journal of Asiatic Studies 73, no. 2 (2013); and a forthcoming article, “Figuring Salvation: The Hōryūji Clay Sūtra Tableaux,” Archives of Asian Art 64, no. 2 (2015). Kaichō denotes “opening of a curtain,” and it refers to the special, public exhibition of a hi-Butsu or a “secret Buddha,” which is otherwise enshrined in a sealed receptacle and kept “secret” behind its “curtain.” A kaichō is a special religious event designed to provide an opportunity for Buddhist followers to appeal directly to the divine compassion of a secret deity. Among many kaichō Buddhist temples, Zenkōji, which had a secret Amida, stood out in terms of popularity and reputation in the early modern period. In this presentation, Hur discusses one of the contributing factors that helped the Zenkōji Amida enjoy the highest status as a hi-Butsu in early modern Japan – its association with the Western Paradise, which was successfully pronounced in the sacred geography of temple’s location, layout, and ritual formula. This sacred geography helped establish both Zenkōji as an entrance to the other world and the Zenkōji Amida as a guide who would lead the worshippers to the Western Paradise. Nam-lin Hur (Ph.D., Princeton) is a professor in the Department of Asian Studies at the University of British Columbia. His teaching focuses upon pre-modern Japanese history and international relations in pre-modern East Asia. His publications include: Prayer and Play in Late Tokugawa Japan: Asakusa Sensōji and Edo Society (Harvard University Asia Center, 2000) and Death and Social Order in Tokugawa Japan: Buddhism, Anti-Christianity, and the Danka System (Harvard University Asia Center, 2007). His current research involves Japan’s invasion of Korea in 1592-1598, kaichō and Buddhist culture in early modern Japan, and Confucian cultural politics and society in Chosŏn Korea. Mark Unno is Associate Professor of Japanese Buddhism, and served as Head of the Department of Religious Studies at the University of Oregon. He received his Ph.D. from Stanford University. His research is in Classical Japanese Buddhism, in particular Shin Buddhism, Zen, and Shingon. He also works in the areas of comparative religious thought, Buddhism and psychotherapy, and interrreligious dialogue. He is the author of Shingon Refractions: Myoe and the Mantra of Light (2004), editor of Buddhism and Psychotherapy Across Cultures (2006) as well as articles and translations in the foregoing fields. Korean objects in museums outside of Korea are all displaced from their original contexts and places. In order to provide accurate backgrounds and stories of Korean artworks on display in their galleries, curators have tried to develop creative display methods. Exhibiting Buddhist art is more complex as religion and iconography of the objects must be discussed in the display and explanations of religious objects. How would Korean Buddhist artwork be perceived by modern viewers who are unfamiliar with Korean traditional culture? How much religious content should be incorporated when displaying Buddhist art in museums? Can Buddhist objects be looked at more as works of art than religious icons? This presentation will examine ways to these questions, and will review examples of how to display Korean Buddhist art. A specialist in Korean and Chinese painting, Hyonjeong Kim Han joined the Asian Art Museum of San Francisco in July 2010. In 2011 she was the curator for the presentation of a special exhibition, Poetry in Clay: Buncheong Ceramics from Leeum, Samsung Museum of Art. She organized a special exhibition titled In Grand Style: Celebrations in Korean Art during the Joseon Dynasty, and guest curated for the SFO Museum, Dual Natures in Ceramics: Eight Contemporary Artists from Korea, a show focusing on ceramics comprised of contemporary artists from Korea. She is now preparing a special exhibition, Mother-of-Pearl Lacquerware from Korea, the first show in the States solely focusing on the subject, opening April 29, 2016. Prior to this, Hyonjeong Kim Han worked at LACMA (Los Angeles County Museum of Art) as Associate Curator of Korean and Chinese art as well as the acting head of the Chinese and Korean Art department since 2006. In Korea, from 2004 to 2006, Hyonjeong worked as a senior researcher in the Institute of Korean Painting and was concurrently a lecturer of Asian art history at Seoul National University. Art museums are repositories of many types of artifacts, including icons and ritual objects associated with various religious traditions. The nature of these sacred works creates potential for both cultural understanding and inadvertent misappropriation. This presentation will introduce a variety of ritual objects whose existence in the art museum reflects a shift from religious to aesthetic/cultural function and provides context for teaching not just art historical, but also ethical and philosophical issues. The child of professors, Anne Rose Kitagawa had the privilege of early exposure to the arts of Asia. After graduating from Oberlin College with a degree in East Asian Studies and Art History, she worked at the Intermuseum Conservation Association in Ohio and the Art Institute of Chicago before receiving a Mellon Fellowship to study Japanese Art and Archeology at Princeton University. Later she worked at the Boston Museum of Fine Arts and the Harvard Art Museums before coming to Oregon in 2010 to become Chief Curator of Collections & Asian Art and the Director of Academic Programs at the Jordan Schnitzer Museum of Art. She now curates and collaborates with UO faculty and students to research and present this museum’s distinguished collections of Japanese, Korean, and Chinese art and has published about postwar Japanese prints, Tale of Genji illustrations, the JSMA’s Korean collection, Japanese lacquer, Asian painting conservation, and the teaching of Asian art in a museum context. Her most recent publication Expanding Frontiers: The Jack and Susy Wadsworth Collection of Postwar Japanese Prints was an exhibition catalogue co-edited with UO Professor Akiko Walley and includes original research and writing by many of their students. Charles Lachman holds a Ph.D. in East Asian Studies (Toronto) and an M.A. in Buddhist Studies (McMaster). His publications include “Images” In Oxford Bibliographies in Buddhism. Ed. Richard Payne. New York: Oxford University Press [In Press]; “Buddhism: Image As Icon, Image as Art,” Chapter 27 in the Oxford Handbook of Religion and the Arts, ed. Frank Burch Brown (Oxford University Press, 2014); and “Art,” in Critical Terms for the Study of Buddhism, ed. Donald Lopez (Chicago: University of Chicago Press, 2005).